Environment Secretary Roy A. Cimatu on Thursday underscored the need to invest in nature to provide cost-effective solutions to the country’s most pressing water challenges in the wake of environmental issues facing the world-famous Boracay Island. “Let us spend to grow more trees to make our forests lusher, and our watersheds more productive. Let us exert more effort to clean up our rivers, lakes, beaches and seas, and to safeguard our aquifers, and to keep them clean,” Cimatu said in his address read by Department of Environment and Natural Resources (DENR) OIC-Undersecretary for Manila Bay Concerns and Related Water Concerns Atty. Maria Paz G. Luna during the national celebration of World Water Day, highlighted by the awarding of water champions held March 22 at Novotel Hotel in Cubao, Quezon City. WWD is observed annually on March 22 to raise awareness about the importance of water and sustainable development. This year’s theme, “Nature for Water” emphasizes the potential for nature-based solutions (NbS) to address mounting water-related problems facing the planet. The annual awards recognize individuals, institutions and programs that made strides in achieving water and environment sustainability in the Philippines. It is the highlight of the local celebration of World Water Day, which is observed yearly on March 22 to raise awareness about the importance of water and sustainable development. Cimatu described the event as “very timely” as he spearheads government efforts to rehabilitate the pollution-challenged Boracay. “Had the good practices of today’s awardees been replicated in Boracay, that world-famous tourist destination would not have been a cesspool,” Cimatu said. According to Cimatu, the government’s willingness to address the Boracay crisis is an acknowledgment that “nature-based solutions have the potential to solve many water challenges. Nature can heal itself if abuses are mitigated before they become irreversible.” “This is evident in the rehabilitation of Boracay, where we are restoring wetlands and addressing wastewater issues through an improved sewerage system for the whole island,” Cimatu pointed out. 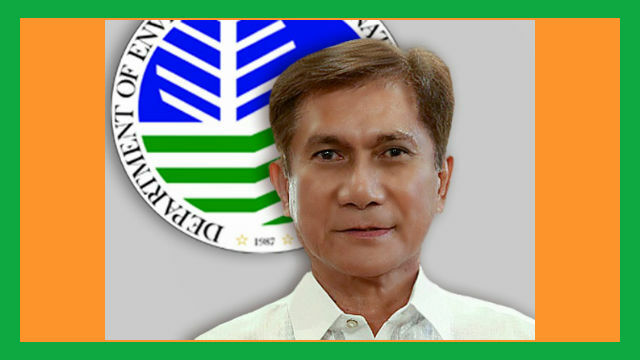 Cimatu said the government will not waver in its efforts to protect and conserve the country’s water resources through continued implementation of vital environmental programs, including the National Greening Program (NGP), the government’s flagship reforestation program. “This massive replanting will go far beyond creating new forests as carbon sinks to mitigate climate change; it will also create livelihood and reduce poverty, provide habitats for biodiversity, recharge watersheds, protect topsoil from erosion, and boost food security,” Cimatu said. At the same time, Cimatu said it is high time the Philippines invest in the so-called green infrastructure, an approach which protects and restores natural ecosystems that provide security to nearby communities. “Countries highly vulnerable to natural disasters, like the Philippines, need to invest more in green infrastructure,” Cimatu said. “Integrating green with grey or traditional infrastructure creates cost-effective, climate resilient communities,” he added. After the awarding ceremony, Luna, on behalf of Cimatu, together with other government officials and representatives from the private sector, signed a commitment document in support of the United Nations resolution on the International Decade for Action: Water for Sustainable Development 2018-2028. This decade for action aims to further improve cooperation, partnership and capacity development in response to the 2030 Agenda for Sustainable Development.